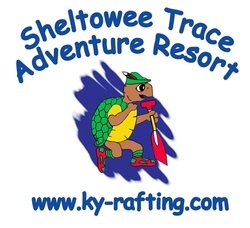 From whitewater rafting to leisurely canoeing or kayaking, from primitive campsites to our resort cabin, wooded trails to waterfalls, Sheltowee Trace Adventure Resort in scenic Kentucky is the perfect place to base your outdoor adventure vacation or get-away! Located just 5 miles from Cumberland Falls State Resort Park, we are conveniently located near the Big South National River and Recreation area, Laurel Lake and the Daniel Boone National Forest. We are easily accessible off of I-75 at Corbin (Exit 25) and Williamsburg (Exit 15).